Review: "Havnatt: Havdoegn EP" - Sea of Tranquility - The Web Destination for Progressive Music! This project started out in 2006 in Norway. The lyrics on some of the songs come from late author Tormod Skagestad. Cecilie Langlie is the vocalist while the music is being handled by guitarist Tom Simonsen. Both musicians are working with bands like: Skumring, Omit and Vagrant God. This EP includes three remixed songs as well as two brand new compositions. 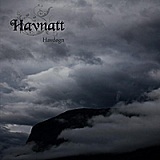 Havnatt is creating dark folkloric music. The songs are pretty much stripped down to minimum by having acoustic guitar and female vocals. The acoustic guitar is plugged-in, having a bit of a synthetic tone. The voice of Cecilie is just beautiful, angelic and with of eerie feel. Although I prefer the organic sound of acoustic guitar when being miced rather than plugged-in, the tone is fitting with the lovely vocals. Tom's playing is strongly based on melodious arpeggios and leads. The patterns created by his work vary from melancholic, dark, eerie and dreamy. On a few occasions, I could hear references from vintage Genesis a la Trespass. This EP puts you in a dreamy mood, well suitable for a rainy day for instance. This is calm, relaxing and easily accessible music. You don't have much variation on the other hand, except maybe on the closing track, "Jernbaneskinnur sov Gjennom Landet", where a piano comes into play. Nonetheless, you won't find a bad song or boring moment on the EP.